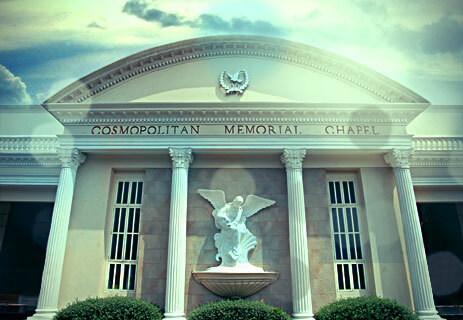 Cosmopolitan Memorial Chapels is the specialists in family care and service in times of need. Since 1950, Cosmopolitan has been the company of choice for people from around the world who expect world class comfort and care. Cosmopolitan has served countless thousands of families with compassionate care in beautiful settings. Many discriminating families, expatriates and balikbayans who have returned home desire world class service and facilities. Cosmopolitan offers world class comfort and care. At Cosmopolitan we maintain a philosophy of respect and kindness that guides everything we do. We want you to receive specialized care from the beginning right through the end of our services. Cosmopolitans specialists in family and decedent care are available 24/7. Always available, Cosmopolitans highly trained specialists are there to understand and to help your family through a difficult time. Delivering leading edge care with kindness, courtesy and compassion and providing service as it should be. Cosmopolitan, always at your service.